“You are an ocean of consciousness, deep and vast, and filled with so much creativity, energy and healing power. Did you know this about yourself? Even if you did, you are about to discover that there is more to you than you realize. Within those hidden depths, there is magnificent undiscovered magic which wants to come alive in your world. There’s something truly wonderful wanting to capture your attention. It wants to be caught! So much so, it’s practically jumping out of your inner ocean, like a flying fish, wanting your attention and a place in your world. The oracle of Go Fish! says that there are powers, abilities, gifts and new ways of being surging up from your unconscious mind. You are bringing forth more of who you are, but it is the ‘you’ that you haven’t really known existed before. So at times it’s going to be surprising, exciting or even a little uncomfortable, as you get used to the extra energy stirring up from within. Healing Trick: “To help you take the wisdom offered and put it to best use in your life now, do this healing trick to clear obstacles to putting this guidance into place. Place one hand over your heart and one hand over your belly. Breathe in and out and relax for several moments, perhaps even closing your eyes whilst you do so. So now I go fish! 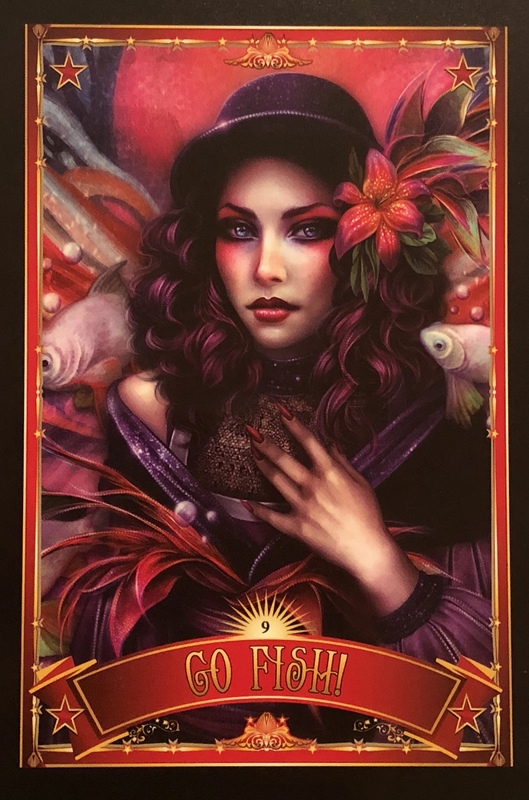 Gaze at the image on the oracle card and imagine, visualize, feel or pretend that each fish is the answer to a problem in your life, coming to the surface now. Affirmation: “Say the following affirmation aloud to boost the power of this message and to integrate it into your body, mind and soul. You can say it morning and/or evening for a few days or even a few months, or just at the end of your healing trick. I love those affirmations at the end: “Treasures once hidden are now revealed; And every part of my life is effortlessly healed.” I love the idea that there are hidden gifts rising to the surface. Things coming together, a new way of looking at things and most importantly, a new way of seeing yourself and your place in the world. The blessings of many lifetimes of learning, and an opening up to receive new cosmic downloads of information to enhance the inner wisdom. Every single day we wake up we get a chance to start over, to try again. We get the chance to reinvent ourselves; creatively express ourselves. Work on ourselves, expand our awareness and believe in ourselves. If we choose to do so. Because of course we can live in the opposite of that too. But what if we decided when we wake up each morning to Wake Up a bit more every day? What if we decided to seek the hidden gifts and talents and put them to good use. What if we focused on the best version of ourselves we could be and refused to doubt our abilities? Something exciting is happening here. It is happening for me and for you, and it is up to us to be curious about it. Open up to it, and align with it.